The season 2013 of the Tuscan olive oil features a not excellent quality. Like every year, the CDR’s R&D chemical laboratory has carried out a research about olive oil quality in Tuscany through the analysis of olive oil samples from several Tuscan districts. 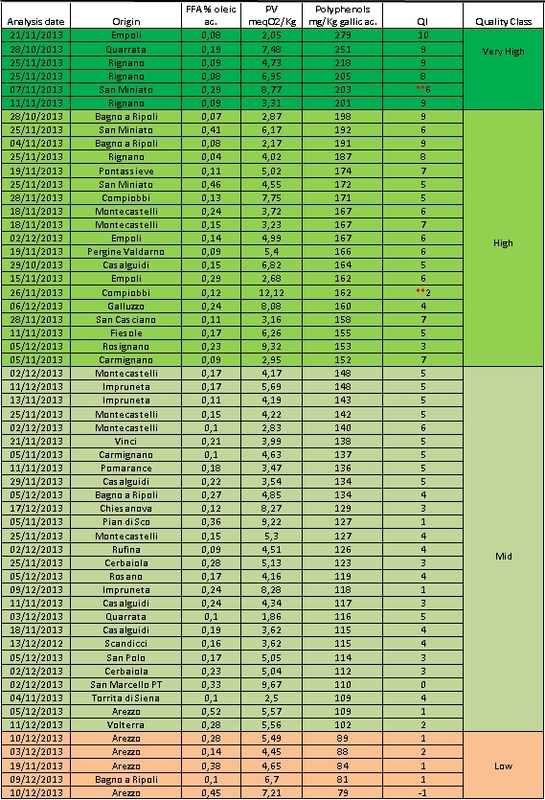 The elaboration of the data allowed to make an evaluation about the quality of this year Tuscan olive oil, that seems to have been damaged by the olive fly, that has infested Tuscany. The samples analyzed are 57 and for each sample we determined the following parameters: free fatty acids, peroxide value and polyphenols, by the use of CDR OxiTester analysis system. We immediately saw a difference with the values of the two past seasons. Compared to past years the average value of polyphenols has lowered, while the acidity has raised; peroxide value is instead in line with the previous years, confirming an excellent level of the oils from an oxidative point of view. Data about polyphenols are definitely given partly by the rains that featured September and November and partly by the ripening of the olives themselves, that in some areas has been made difficult by climate. Free fatty acids have increased because the plants in some areas suffered the attack of the olive fly and the high temperatures accentuated its influence on the acidity (FFA). We reported below the results of the samples analysis, classifying them in descending order relative to the value of the polyphenols, identifying this way four quality categories: Very High, High, Mid and Low. The parameter of the polyphenols is a fundamental indication of the olive oil quality. 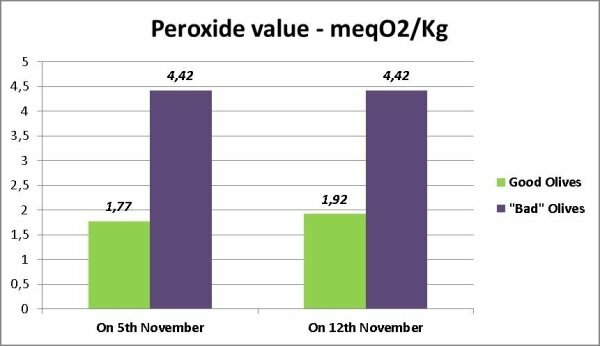 Nevertheless FFA and peroxide value have to be taken into account for a complete and deep quality control. That is why we put in the table a QI – Quality Index beside the quality class: QI is obtained weighing up all of the three parameters, determined with CDR OxiTester: acidity, peroxide values, polyphenols. The QI underlined in the table with the asterisks show indeed how an oil with an high peroxide value collected a lower QI score in relation to the quality category in which it has been inserted, because of the high peroxide value and FFA. In the first case: QI 6, given by FFA = 0,29 and peroxide value = 8,77, but polyphenols = 203; in the other case: QI 2, given by FFA = 0,12 and peroxide value = 12,12 and polyphenols = 162. For mid and low quality oils the QI indexes goes from a maximum of 6 to a minimum of -1. The highest QI in the table is 10. 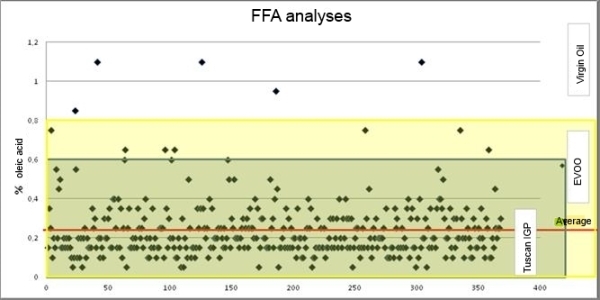 Right the increase of the FFA values was the starting point for the observation of the effect of the olive fly attack on the FFA data and parameter in general. The FFA values of the two samples are very different one each other, especially the ones of the good olives, that have produced an oil with very low FFA. The oil obtained from the “bad” olives came out more acid, as we expected. 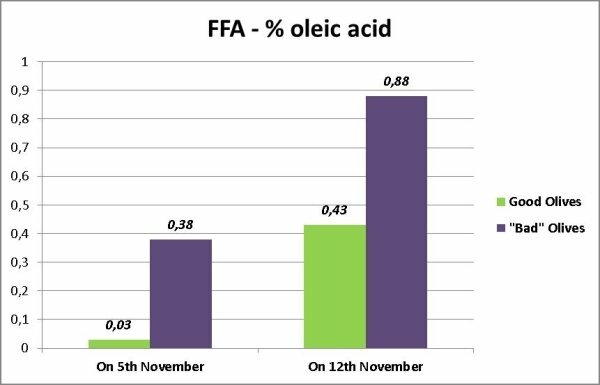 At distance of one week, FFA is considerably increased in the both cases, both the oil obtained from good olives and the oil obtained from the “bad” olives: the increase was respectively 0,4 and 0,5 (oleic acid). Talking about peroxide value, important analytical parameter for the quality control, the content in the oil extracted from the “bad” olives was about two times the content in the oil extracted from the good olives. That is due to the process of the hydrolytic oxidation of enzymes (lipase) that is favoured by higher temperatures (20 – 30 °C). Read the study published on HortScience as well. We wanted to make a comparison with other samples of oil so we asked OTA oil mill, in Cerbaia, Florence, if we could have results of the analysis carried out during the whole season and observe the FFA parameter. The values are indeed very high (wide presence of many batches with olives struck by the olive fly) compared to the values registered last year: 0,1% oleic acid in average in 2012 against 0,24 % oleic acid in average in 2013. Values are therefore more than doubled. That is why during the year the analytical control and tests on the oil just produced inside the oil mills have gained importance, because the analysis can provide a first immediate information about the product and the product group to which it belongs. Olive oil quality season 2013: the study of the CDR chemical laboratory was last modified: April 12th, 2019 by CDR s.r.l.